Junior Ryanne King sprints past Gladiator defenders. King did all she could for the Mill, scoring six of their nine goals. She has played a huge role in the offense’s 102 goals scored this year. 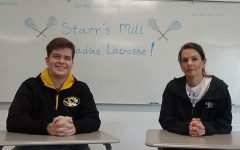 Close games are few and far in between for the Lady Panthers lacrosse team during the regular season. They opened the season 5-0, outscoring their opponents 93-5 in those games. 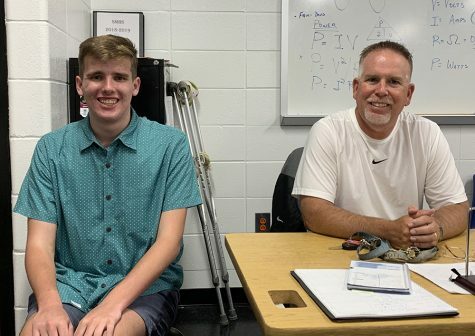 However, Johns Creek traveled to Panther Stadium last Saturday and managed to hand the defending state runner-up their first loss of the year, 10-9. The contest went to triple overtime, but the Gladiators struck first in the sudden death minutes. 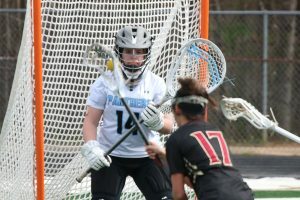 Junior Ryanne King caused problems for Johns Creek, scoring six of the Lady Panthers’ nine goals. The other three goals came from senior Ansley Wallace, sophomore Jacqueline Broderick, and freshman Emma Grace Hepler. In goal, junior Karlee Jenks and sophomore Kaitlyn Donovan each played one half. While both made many great saves, a late second half run by the Gladiators forced overtime, in which they stole the win on the road. Johns Creek was led by juniors Avery Mcilwaine and Sandy Salit, as well as sophomore Ava Trankina. Each scored one of the Gladiators’ first three goals, and Trankina found the net again in the second half. The defense from the Lady Gladiators disrupted the Mill all game long, causing sloppy play from the Lady Panthers. Lady Gladiator faces Panther goalie Kaitlyn Donovan. 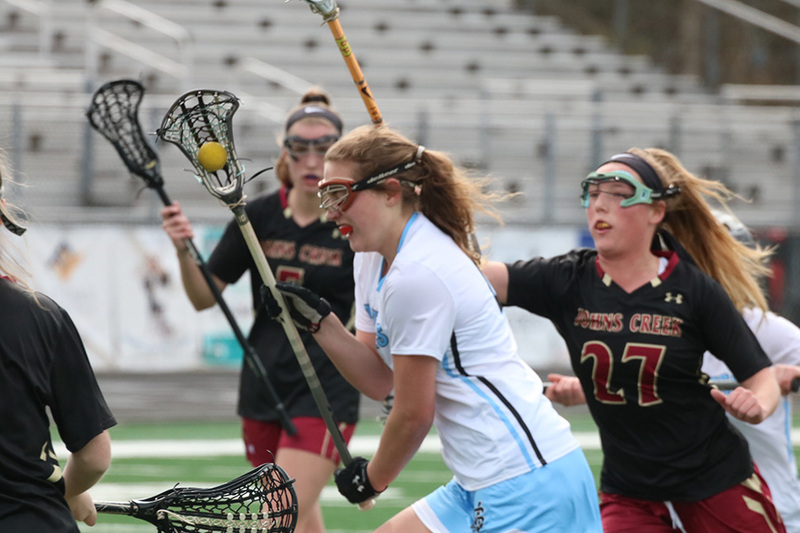 Donovan played in the second half against Johns Creek, and despite making many saves she allowed five goals in the half, allowing Johns Creek to overcome a late-game three goal deficit and force overtime. Johns Creek opened the scoring early on in the match, finding the net at the 22:26 mark. The score stayed at 1-0 until the clock read 17:41 when Broderick evened the score at 1-1. A minute later, King scored again and put the Mill up 2-1, but it only lasted for a few minutes until Mcilwain tied the game again. The scoring continued to go back and forth throughout the half. King battled with Trankina and Salit as neither side gained an advantage. Once halftime hit, Starr’s Mill led 5-4, with four of the goals coming from King. King reminded the Gladiators she wasn’t to be stopped, opening the half with her fifth goal of the night. Trankina answered quickly, however, keeping the score close at 6-5. At the 13:11 mark, Hepler scored her only goal of the game to put the Panthers back up 7-5. Wallace then extended the lead to 8-5 with another goal at the 11:15 mark. 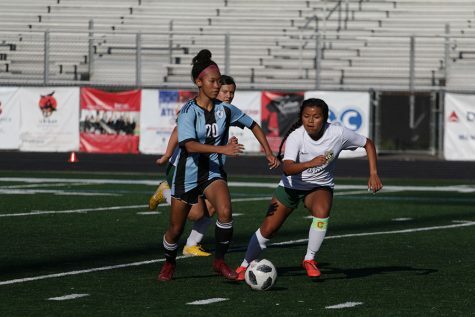 Johns Creek got one goal back, but King nullified the goal with her sixth score. With eight minutes left, Starr’s Mill held a three-goal lead and just needed to chew the clock out. At the 6:57 mark, however, a Lady Gladiator run began. They scored one goal to bring the score to 9-7, then scored two more goals in the final minute and a half to force overtime. The first overtime saw little action, until the Panthers gained momentum near the end of the period. However, time ran out on the Mill, and the second overtime began. 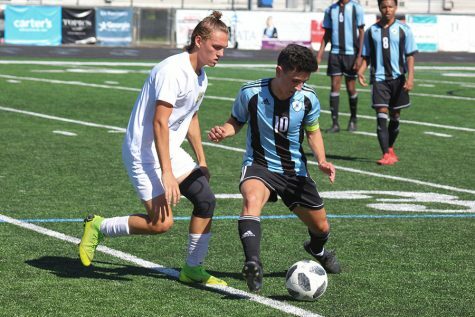 The second overtime was a change of pace, as neither side found any clear looks at the goal. The third overtime began and was sudden death. King had a clear look at goal early on but was shoved to the ground. The referee ruled a crease violation on King, giving possession to Johns Creek. The Lady Gladiators then took off down the field, beating the unprepared Starr’s Mill defense. 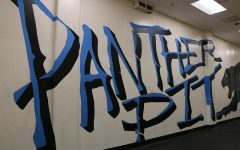 They leaked behind the Lady Panthers and got an open look, scoring the game-winning goal. The 10-9 loss was the Mill’s first of the season, dropping them to 5-1 overall. The win moved Johns Creek to 7-1 on the season. 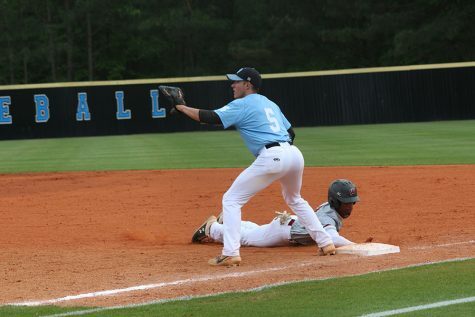 Starr’s Mill returned to winning Tuesday night with a 20-0 victory over the winless Hampton Hornets.